A few eager tourists scatter the strangely empty streets in Vancouver’s Gastown, their shirts sticky with sweat and their tongues stained from tasting gelato a few blocks away. There is one storefront on the block that bursts with colour—a florist, marigolds half price today—but the rest of the block is grey, grey, grey. Climb up one set of stairs from the street to molo design’s production studio and life is noticeably different. The lofty space glows as daylight shines through the long, slender wall of ivory paper blocking their street view. This is molo’s signature “softwall.” Today, it acts as a curtain, shielding us from the dreary afternoon with its thousands of delicate honeycomb folds. The softwall stands tall, wrapping the room in a cool white light. It is like looking through a cloud, thick yet transparent, into the vague shapes of the world below. When the sun finally arrives, clearing the muggy atmosphere away and driving people onto the patio of the bakery across the street, we can clear our view, too. The softwall slides aside, weightless, folding into a fraction of its full size, politely allowing the street scenes and sunshine to take centre stage. The softwall waits patiently to be needed again; this is the nature of the product. Softwalls are there when you need them, and gone when you don’t. They are simultaneously fluid and structured, and perfect for urban spaces. For Stephanie Forsythe and Todd MacAllen, directors of molo design, space shapes our lives and creates the borders and contexts in which we live. The designers’ pieces reflect our need for flexibility in our home and public spaces. Forsythe and MacAllen’s first collaborations were as students at Dalhousie’s School of Architecture in Halifax. Together, they gained acclaim through design competitions. Their impressive designs included floating drinking glasses, seating, walls, and lamps. In 2003, the design team shaped the prototypes for their “soft” structures. That same year, they founded molo to produce their unique creations for the clamouring public. First came their walls, and then round, comfortably knobby stools—“softseats”—that unfurl unexpectedly from unimpressive stacks of cardboard, like Chinese lanterns. Today, molo products gently straddle the border between form and function. Their softseating and softwalls are exhibited in international art museums and shows, including the permanent collection of New York’s Museum of Modern Art. 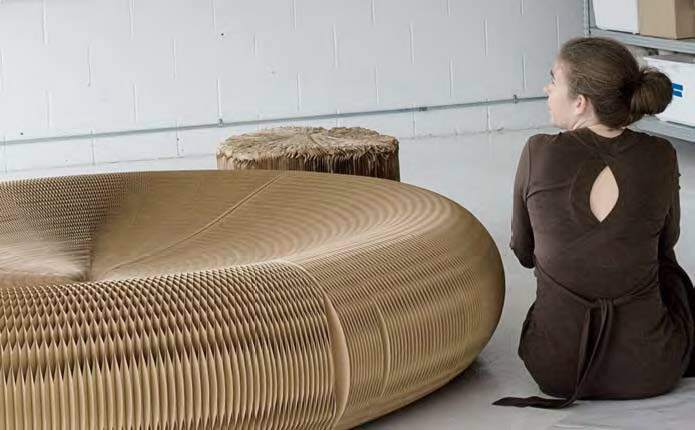 However, molo’s comfortable, durable, and flexible designs look just as fitting in your home. Safely cocooned from the world behind softwalls, Forsythe, MacAllen, and Sad Mag pulled up three well-worn paper stools and talked about cardboard construction, art, space, and inspiration. Sad Mag: What is it about paper and cardboard that appeals to you? Stephanie Forsythe: When we first started, we were at a stage where we’d sold all our tools to go back to school. We were sitting in a small workspace in downtown Vancouver figuring out how to make things, and found we could make things with paper. We could fold and cut. It was a real blessing because if there were conventional tools around us, we might just have continued to fabricate things in a way we were used to fabricating them, but it was nice to sit down and work with something in such an immediate way. Paper has this abstract quality to it that’s inviting to the imagination. It can become anything. Everyone plays with cardboard boxes and paper growing up, and artists through the centuries have worked with cardboard. SM: As architects by trade, both of you have designed large buildings. How do you feel about finding yourselves working on a considerably smaller scale? Todd MacAllen: That’s something that has always been a part of how we worked and wanted to work; it’s not a surprise to be doing what we’re doing right now. We’ve always had an interest in other avenues, exploring design materials or ways of thinking about space. It wasn’t ever just about buildings. Even in architecture school, it was always about printmaking, painting, and ceramics. SM: Besides paper, what inspires you? There’s clearly some influence from honeycomb in your softwalls and seating. Do you intentionally look to nature when designing? SF: Looking at a flower or leaf or seashell in nature, you can see that there’s one geometry that everything grows out of. Just watching what the honeycomb does, and then intuitively shaping and following the fanning movement that’s inherent to it, that’s something more beautiful than anything we could predetermine. SM: Do you think your ideas about space will ever find their way outside of the home? TM: It’s really infinite. We tend to follow the path of least resistance. Anything we can do that presents an opportunity to create an idea and follow it through with hands-on materials and work, we’re up for it. SM: Last January you completed a hands-on project in Alaska, in collaboration with musician Ethan Rose. SF: The Northern Sky Circle [an outdoor room and public art piece made of snow] was particularly rewarding because it provided an opportunity to transform a public space in the city. The process of construction and the end result was something that was somewhere between art and architecture, permanent and temporary. It was built very concretely in space, but at the same time we knew that it would melt away. It had so many different freedoms about it. It was amazing just being able to watch people interact and engage with it, and watch people run around the top, jump from wall to wall—all the things no one would let you do if you told them you were going to build this in a public space. We’re always trying to find what we’re looking for in our work, because most of all, it’s not just about building a business, it’s about having a life and being able to explore life through design. The idea of being able to alter public space is really interesting to us. SM: In addition to the Alaskan frontier and living rooms around the globe, your work is currently on display internationally in museums and galleries. Your work balances form and function beautifully, and as a result, you’ve been embraced by both the art world and, well, the real world. TM: It’s fortuitous. I think it’s just naturally our place, to straddle those different things. Stephanie and I feel that art is a way to explore the world. Something is art if it gives me a way to look at things for the first time with fresh eyes. SF: Art and design are interchangeable worlds, in many ways. If you were to define them separately, you might talk in terms of the utility of a designed object, but certainly something can be both artful and useful. It begins with us exploring things, but by the very nature of designing something, we’re putting something back into the system, something for other people to experience. Our designs will help people explore the world in different ways and from different perspectives than the ones we started with. This piece was first published in 2009 for Issue No. 1: Premier. Visit our shop to purchase Premier and other past issues of SAD!